(left to right) Michael Idalski, Nicole Frydman and Sam Massey in Flying Elephant Productions’ revival of THE BOOK OF MERMAN. All Production Photos by Evan Hanover. Flying Elephant Productions has done it again, launching a creative, high energy new musical that's now playing an open-ended off-Broadway run. 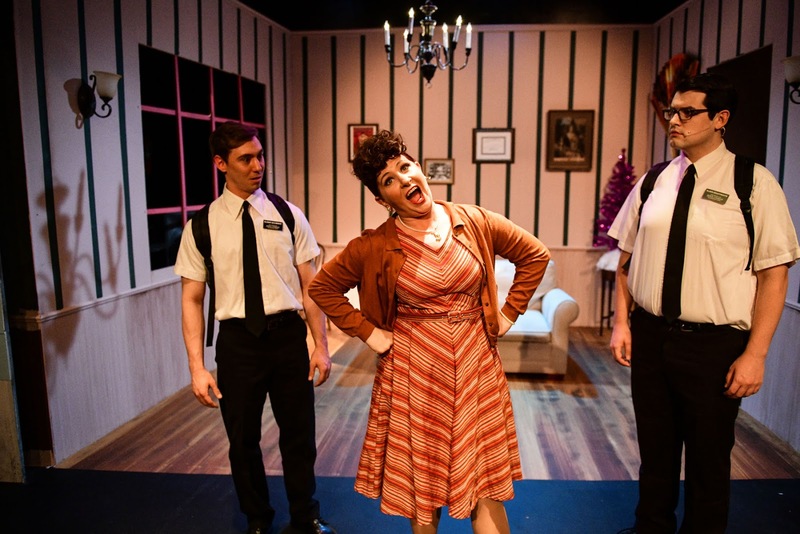 Happily, they've not forgotten their roots, and Chicago gets treated to a playful remount at Stage 773 as well! This cleverly written tribute to Ethel Merman includes a fun stand off ala Annie Get Your Gun, reworded nods to Gypsy, and an overarching narrative that has two door to door Mormon missionaries bumbling through their sexual crushes, secret creative endeavors, and life choices. 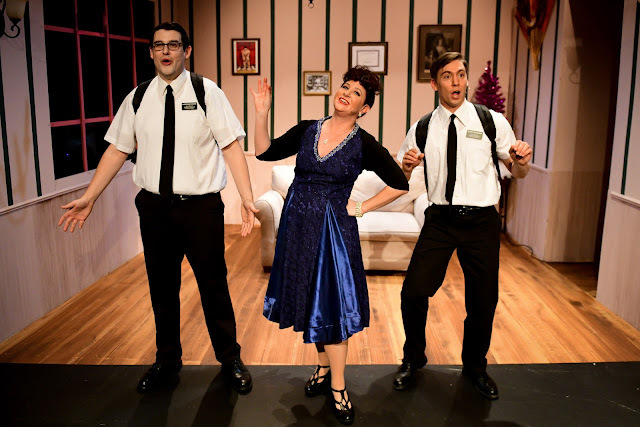 Nicole Frydman (Ethel Merman) is a dynamic dame with powerhouse vocals, and a joy to see in action. Michael Idalski and Sam Massey are the perfect combination of enthusiasm and wide eyed naivete. More of the songs are solidly based on Merman musicals and have less to do with The Book of Mormon. I was hoping for a bit more camp and humor like Spamilton, which lampooned not only Hamilton but a bevy of Broadway hits, and was laugh out loud funny throughout. Still, THE BOOK OF MERMAN has a sweet, uplifting message and hilarity ensues when things take a turn for the modern, with a hip-hop rendition of Pirates of Penzance ala Merman. THE BOOK OF MERMAN has a chance encounter changing everyone involved for the better, right down to the last plot twist. 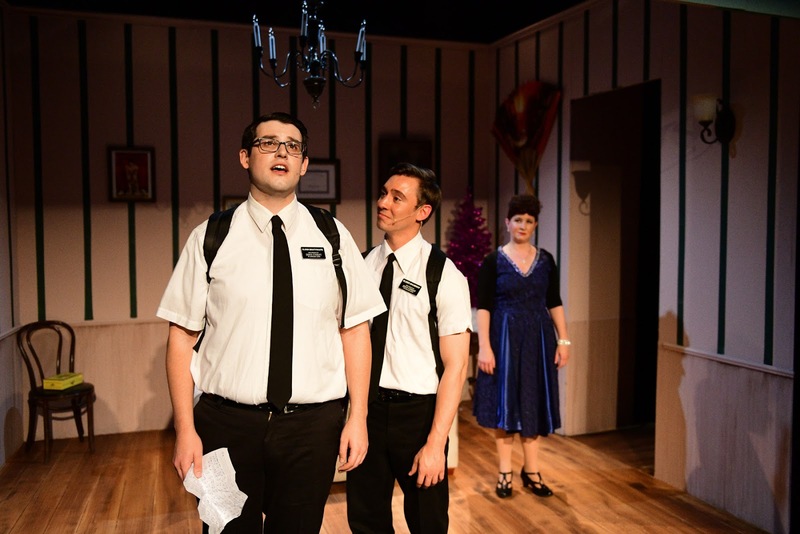 Ultimately this production is a fun night out for musical theatre lovers that's likely to bring on the jazz hands and bring out the diva and the thespian in all of us. Recommended. Bonnie Kenaz-Mara is a Chicago based writer-theater critic-photographer-videographer-actress-artist-general creatrix and Mama to two terrific teens. She owns two websites where she publishes frequently: ChiILLiveShows.com (adult) & ChiILMama.com (family friendly). Flying Elephant Productions is pleased to present the return of the hit musical comedy THE BOOK OF MERMAN, featuring a book by Leo Schwartz and DC Cathro, music and lyrics by Leo Schwartz, direction by DC Cathro, music direction by Tyler Miles and choreography by Jenna Schoppe. THE BOOK OF MERMAN will play November 24, 2018 – January 6, 2019 at Stage 773, 1225 W. Belmont Ave. in Chicago. Tickets are currently available at stage773.com, by calling (773) 327-5252 or in person at the Stage 773 Box Office. The press opening is Saturday, December 1 at 8 pm. The new Chicago production will feature Nicole Frydman, Michael Idalski and Sam Massey. 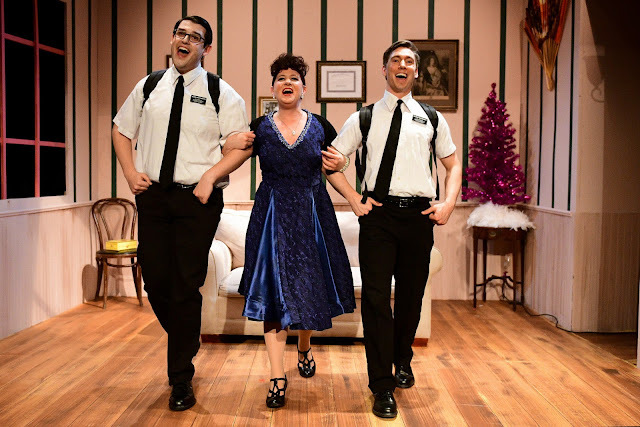 Two Mormon missionaries ring Ethel Merman’s doorbell and hilarity ensues. It’s a diva driven journey of self-discovery with an original score of comedy songs, power ballads and mash-up standards. THE BOOK OF MERMAN is also enjoying its off-Broadway debut this fall. 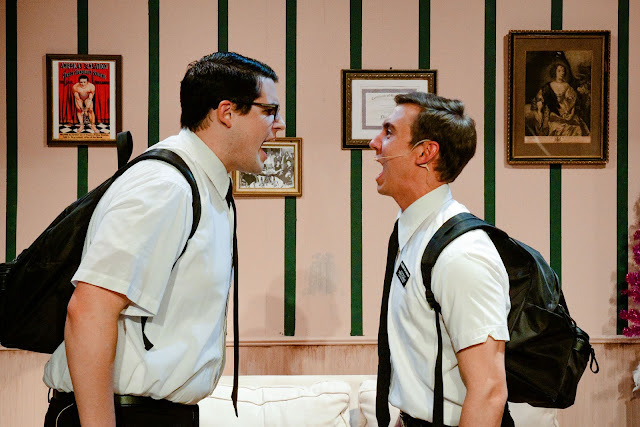 The production opened on October 5, 2018 for an open-ended run at St. Luke’s Theatre (308 West 46th St.). For additional information on the New York run, visit www.bookofmermanmusical.com. THE BOOK OF MERMAN has also played in Portland, OR, Columbus, OH, Indianapolis, IN and Washington, D.C., and Birmingham, AL. THE BOOK OF MERMAN debuted with Pride Films and Plays in January 2015. Following a successful run at Mary’s Attic, the production transferred to Chicago’s Apollo Theater for an additional three months. 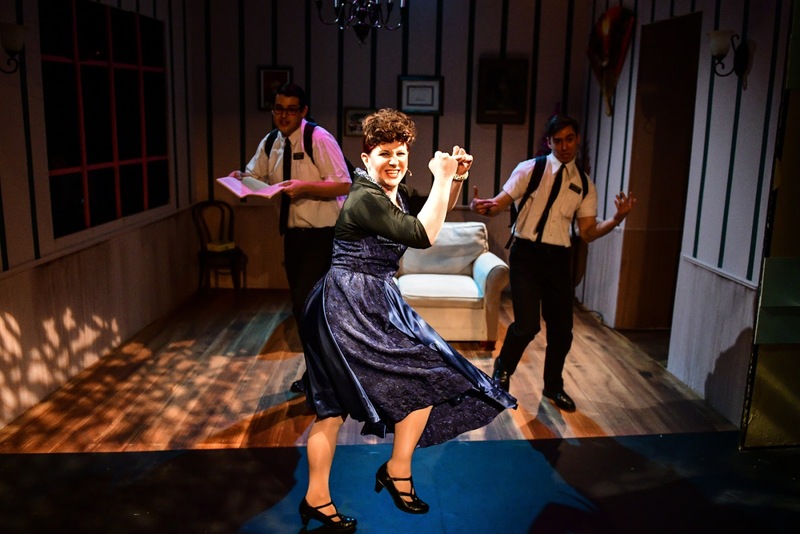 The production team for THE BOOK OF MERMAN includes: Nicholas Schwartz (scenic design), Rachel Sypniewski (costume design), Jaysen Kralovetz (props design) and Jack Rhea (stage manager). Dates: Previews: Saturday, November 24 at 7:30 pm, Sunday, November 25 at 7:30 pm, Monday, November 26 at 7:30 pm (Industry Night), Thursday, November 29 at 7:30 pm and Friday, November 30 at 7:30 pm. Curtain Times: Wednesdays, Thursday, Fridays and Saturdays at 7:30 pm; Sundays at 3:30 pm. Tickets: Preview $30. Regular run $40. Industry Night: Monday, November 26 at 7:30 pm. Tickets $10. Leo Schwartz (Book, Music, Lyrics) is a multi-disciplined and award-winning composer of stage and screen. He is the producer and writer of the Off-Broadway musical The Book of Merman. His musical Till, about Emmett and Mamie Till, won the Mainstreet Musical Theatre Festival in 2016. His musical Under A Rainbow Flag, won the Joseph Jefferson Award for Best New Work in 2013. His musical song cycle, We The People: Songs of the Resistance was premiered by Flying Elephant Productions in January of 2018 in Chicago. His works have been performed in Europe, the New York Musical Theatre Festival, at the York Theatre and across the United States. He is Executive Director of Flying Elephant Productions and his work can be heard and seen at www.leoschwartz.com. DC Cathro (Book, Director) is a playwright, actor and director from the Washington, D.C. metropolitan area. His musical Till, written with award-winning composer Leo Schwartz, is one of three winners in the 2016 Main Street Musicals Festival, selected by Gregory Mosher. In 2014, he became the only playwright to have two shows in the Pride Films and Plays Festival in Chicago: Pen, A Musical (also written with Schwartz) and Family Holiday. DC's works have been performed and read at theatres and festivals across the U.S., including The William Inge Festival in Independence, Kansas, The Kennedy Center in Washington, D.C. and Greenhouse Ensemble Theatre in New York City. Tyler Miles (Music Director) is a Chicago composer, teacher, music director and performer. He has written songs and incidental music for over a dozen film and theatre pieces. 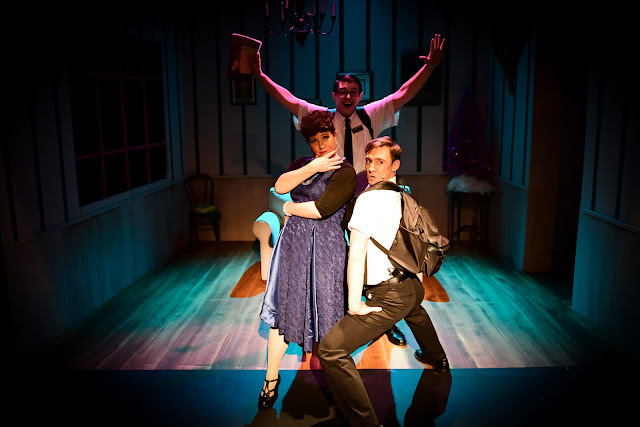 Currently, in addition to teaching over two dozen students, both young and adult, Tyler is working as a music director in the Chicago theatre scene where he is also in the process of developing an original musical with and about the successful cabaret singer Honey West. Tyler holds a bachelor’s degree in Music from Northeastern Illinois University. Jenna Schoppe (Choreographer) is proud to help Flying Elephant Productions bring The Book of Merman back to the stage. Her previous choreographic endeavors include Yank: A World War II Love Story (PFP – Jeff Award-Best Choreography), Shrek (Windy City Performs), Oliver (Windy City Performs), The Producers (NightBlue Performing Arts), Now. Here. This. (Brown Paper Box Co.) and Bobbie Clearly (Steep Theatre). You can catch her dancing most weekends at The Kiss Kiss Cabaret at Uptown Underground. Nothing is more challenging than getting a creative career off the ground. In many ways, it would be easier to get an elephant to fly. 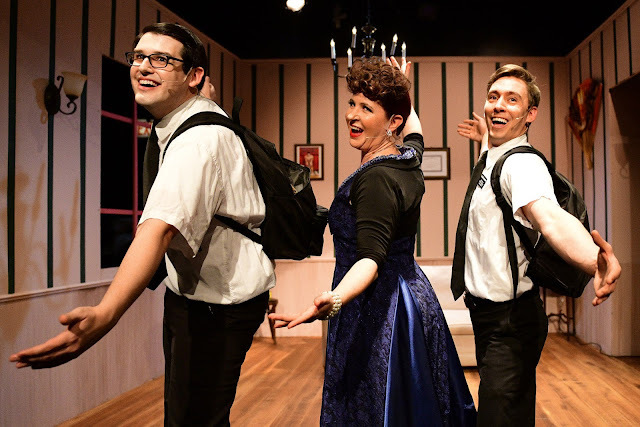 Flying Elephant Productions is dedicated to presenting new works, musicals and plays, that are dynamic, impassioned, and, in our belief, prone to fly. We not only give them first voice, but will also work with the creators to market and promote their work further. Our success at production and our entrepreneurial experience make us a uniquely qualified voice in theatre. For additional information, visit www.flyingelephantproductions.com.